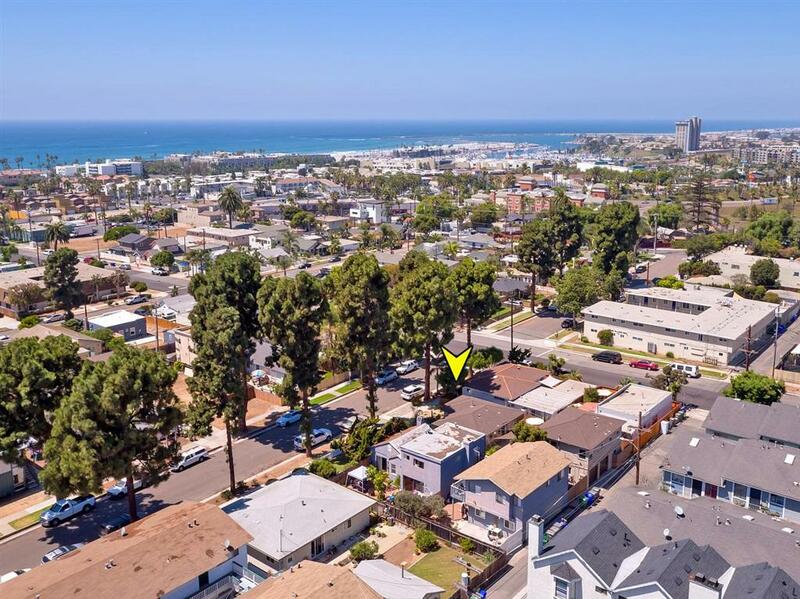 INCREDIBLE opportunity walking distance to the beach, shops & restaurants! Enjoy the coastal breezes in these GORGEOUS & move in ready homes & start collecting income! All 3 units have been completely remodeled exterior to interior! Hard to find with such incredible upgrades, two garages w/new roll up doors, and even a community laundry ROOM (currently used as storage for Airbnb supplies). Studio is booked year round on Airbnb*FANTASTIC income while you reside here or rent all 3 units**SEE SUPPLEMENT** Owners currently reside in 2 units & rent studio on Airbnb*Top of the line matching appliances, front unit has laundry area off kitchen w/matching cabinets, marble counters, subway tile backsplash to the ceiling w/some open shelving. Great for storage and folding area. Real hardwood floors, canned lighting, dining area off kitchen. Bathrooms remodeled w/large walk-in shower w/marble tile surround (front house) pedestal sink, (2nd unit) has large walk-in shower w/gorgeous tile surround and new vanity & shelves, also LARGE walk-in closet w/bult-ins & window. PEEKABOO OCEAN VIEW from large bedroom window*3rd unit studio boasts laminate/wood flooring, kitchenette w/sink/garbage disposal, cabinet & stainless counter, open shelving, bath has walk in shower w/tile surround, pedestal sink & open shelving. new windows & custom blinds*newly painted, new fences, custom rock facing on exterior & vintage awnings. Large courtyard area with large shade sails, string lights, custom cement work, tropical plants & tree's w/drought tolerant landscaping. Newer electrical, new water heaters, SO MANY UPGRADES!!! Studio is currently used as Airbnb which is nice extra income for the homeowner w/glowing reviews and repeat clients. Rare to find with all the improvements, location, garages, laundry room with nothing left to do...Move in or start collecting rental income! Walk to bustling downtown with restaurants, shops, breweries, theaters, Oceanside Pier, popular Farmer's Market & enjoy sunsets in the harbor watching boats sail and fine dining. Listing provided courtesy of Re/Max United. Listing information © 2019 San Diego MLS, Inc.